To start off, I decided I wanted to use doilies. I love how they add texture and design to the page. I cut a pink one in half. I adhered it to the page and added some washi as a border. I love how it gives the spread some definition! I added the Abigail stickers for the days of the week and used some Fancy Frills borders to define the sections for each day. Then I started decorating. I love the sweet bunnies and wanted to incorporate them, along with the egg hunt theme on this spread. I decided to use the flower die cuts and added some sequins to their centers. I love how it gives the spread a bit of sparkle. After that, I created this book mark using the twine. I love how the colors coordinate so perfectly. 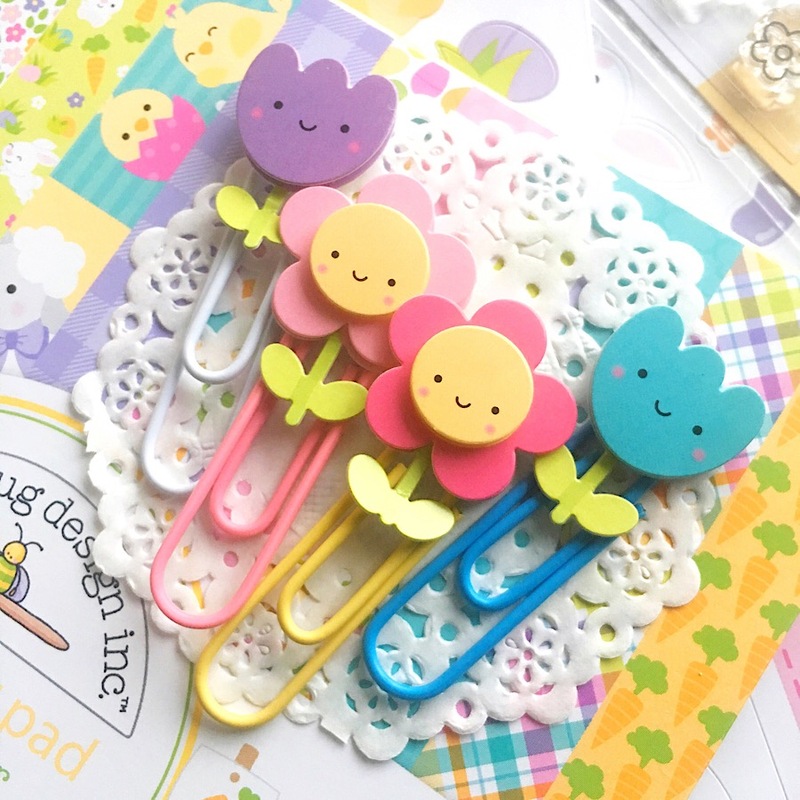 Another accessory for this week's spread is the clips I made using the Flower Friends Mini Pops. They are just so cute! I adhered them to a paperclip using hot glue. I love how this set turned out. Seriously, look at those adorable faces! I decided to add them to the side of my TN so they could be highlighted every time I open it up. So, that's how my Easter week spread came together. I hope you like it! Thanks so much for stopping by! Love that twine bookmark & those clips... so cute!! !